You may consume raw Arugula and even have it in its semi cooked form as a part of the salad. The calorie content in each of these forms is different from the other. Half a cup of raw Arugula contains 2 calories out of which 52% calories are obtained from carbohydrate, 26% calories come from proteins and 22% calories come from fat. The total fat content in Arugula is 0.07 gram, total carbohydrate content in it is 0.36 gram and protein content is 0.26 gram. Consuming 1 oz of raw Arugula means taking in 7 calories. On eating 100 grams of Arugula you will get 25 calories and 1 Ib of Arugula means consuming 113 calories. Arugula Salad is quite a popular choice; it is one of the commonly consumed Arugula preparations. 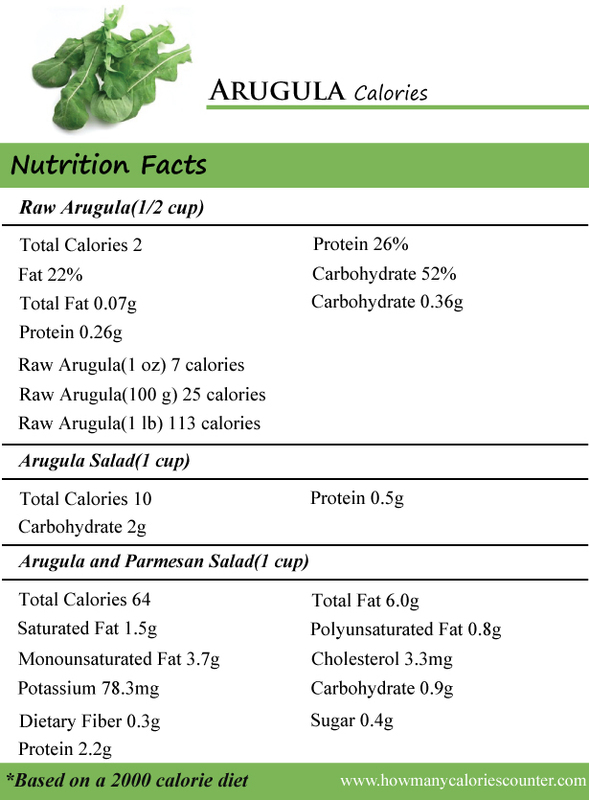 One cup of Arugula salad blend contains as less as 10 calories. It contains 2 grams of total carbohydrate content and 0.5 grams of protein content. Arugula and Parmesan salad cooked in olive oil is also liked by many. However, the number of calories in this salad is quite high. One cup of Arugula is added in a standard serving of Arugula and Parmesan salad. Each serving of this salad contains 64 calories. Out of these 64 calories only 5 calories are obtained from Arugula. The remaining calories are obtained from Olive oil and Parmesan Cheese which contain 40 calories and 18 calories respectively. The total fat content in Arugula and Parmesan salad cooked in olive oil is 6.0 grams consisting of 1.5 grams saturated fat content, 0.8 gram polyunsaturated fat content and 3.7 grams of monounsaturated fat content. It also content 3.3 mg cholesterol, 470.6 mg sodium and 78.3 mg potassium. The total carbohydrate content in it is 0.9 gram, dietary fiber content is 0.3 gram, sugar content is 0.4 gram and protein content is 2.2 grams.